We live in a world where the market dictates product creation, displacing artistic craftsmanship and forfeiting quality for the sake of quantity. That being said, there are still some true artists out there, slightly hidden in the middle of a society dominated by giant corporate monsters. Matt Nolan Custom Cymbals keeps it pure, bringing artistry and quality to the masses who are still looking for it. Following an accidental online discovery, Matt Nolan’s website popped up on my computer screen and immediately captured my attention and filled me with awe. Eager to known more about the man behind the incredible work I was researching, my fingers enthusiastically started typing an email to inquire about a possible interview. This feature interview is what followed. MGR: Let’s begin with how it all started. Where did your interest in starting to make hand-made cymbals come from? Matt Nolan: Hmm, let's see. I've been playing drums since I was about 13, having been in the school choir before that. Playing in the school orchestra was followed by drumming in the college "dance band" (like a small big band) and then rock, pop and jazz-funk groups through university and beyond. Today, I play in a rock band, a piano boogie band and I play avant-garde free-improvisation with a great experimental guitarist using a big rack of my gongs. I've never really stopped playing drums since I started, but there was a period about 6 or 7 years ago when I wasn't able to do much due to domestic / family reasons. I think the need to be creative had to find a vent. Being in a band takes lots of time and a strict schedule. Whereas tinkering with making cymbals could be done on a more ad hoc basis. Also, just prior to that, I had been playing mostly on electronic drum pads, with headphones. I mean, they were pretty good - the mesh head V-Drums - but starting back again on acoustic drums with real cymbals was such a joy. The nuances and subtlety of expression possible with real cymbals especially so. Thus, a fascination started to grow. MGR: Where does some of your inspiration come from for some of the intriguing designs and forms you give your cymbals and gongs? Matt Nolan: I'm working from a visual as well as a sonic aesthetic. Sometimes it was "I wonder what this shape will sound like "sometimes it was" I wonder what shape you need to get this sound I can hear in my mind's ear". The more you do, the more you learn, the more you can predict the answers. Cymbals and Gongs are about material, shape and tension. Shape has many dimensions, and tension can be evenly distributed or varied. Also, in conjunction with or separately to shape, you can play with surface finish to create designs. I like natural forms and I like geometry. I have the most fun when I can bring the two together somehow. MGR: From a sound perspective, how would you differentiate Matt Nolan Cymbals from the ones found in retail stores? Matt Nolan: I like mysterious sounds, unusual sounds, dark and smoky sounds in general. A lot of the cymbals I make are dark and often quite dry also. But I like a good depth of expression too: a cymbal that has lots of different sounds hidden in it, sounds you have to learn to play as you get to know the cymbal better. I try to make cymbals that are truly different, that give the player more scope to define "their sound". Having said that, I do produce some more mainstream sounding cymbals too every now and again. MGR: You work on your own, right? Or do you rely on anyone? Matt Nolan: Right. Just me. Cutting, hammering, playing with fire, cleaning, buying materials and tools, making tools, selling, packing, shipping, answering phone and emails, doing the website, making youtube videos, doing the accounts, planning shows, setting them up, manning show booths, the lot! I spend less than half my time actually crafting. Though that balance is slowly shifting upwards. I'm lucky in that I have a few friends that help out here and there. For trade shows and public drum shows, there's usually somebody who's good enough to help me on the booth so I can dash away to see other things, take a lunch break, etc. I have a good friend locally who is a bit of a photographic and video genius too. He helps me out occasionally on those fronts and lots of the time with general advice and encouragement. MGR: How long does the process of creating one of your cymbals usually take? Matt Nolan: Usually around 4 to 8 hours. Or, to answer that from a different angle, about 6 years! MGR: Every craftsman had a teacher. Where did you learn the techniques you apply to craft your cymbals? Matt Nolan: Well, really, I am more-or-less self taught. Most independent cymbal makers are. You work things out by trial and error, and by studying existing cymbals. You use your eyes, your ears and your fingers. But, I would be dishonest if I left my answer there. I did read a lot of postings on a web forum called cymbalholic.com by the independent cymbalsmiths Mike Skiba (USA) and Johan van de Sijpe (Belgium) - both sadly now passed away. Oddly though, I never really understood what they were talking about until I had actually experienced it myself. You get the light-bulb moment later on. Also, I owe a great deal to the nomadic Welsh metal-crafter, Steve Hubback. I bought a ride cymbal from Steve (via cymbalholic) when he was living and working in Iceland. Now he's living in Prague, in the Czech Republic, but for a short time he was living in Wales and not that far from me in Bath. The cymbal I bought was amazing. I bought it before it was made, so the first time I saw it was when I opened the box. I still remember the amazement in seeing it. A work of art. Such a unique sound though. I wanted some brothers and sisters for it. So I went to see Steve in Wales a couple of times. I watched him work and he showed me a couple of things. Nothing in too much detail though. Which is good. It is nice to find your own way, so the work you produce has a more personal style. MGR: What materials are they usually made of? Matt Nolan: I use a variety of Bronzes from B5 to B15. Recently I've been dabbling with B20 too, though I want to keep that to a minimum really as that is getting into "same as everybody else" territory. Ultimately it is about sound, and the different sounds of each alloy. A lot of people look down their noses at stuff like B8 or anything called "sheet Bronze". I hope to change this view. In fact, I am already - word is slowly getting out. If you put the time and care and effort in, wonderful hand-hammered cymbals can be made. Outside of strict Bronzes, I use a couple of Bronze-like alloys too. I also use Nickel Silver, mostly for gongs but occasionally for hi-hat bottoms. I make cymbals and gongs from certain alloys of Stainless Steel - a very different sound world. I've been doing some experiments with Titanium and Titanium Alloys. Similar in sound to Stainless, a bit brighter and less dry. Very light and very strong though. Also, incredibly hard to hammer - ha! 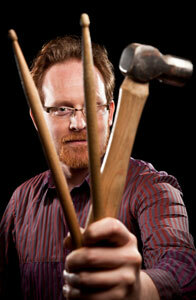 MGR: Currently, how many different types of metal percussive instruments do you offer in your catalogue? Matt Nolan: Difficult question. My current paper brochure just has a few examples in it and my website doesn't have everything on it - which it needs to. I need more hours in the day. Let's see. I guess if we stick to groups of instruments then it's not so difficult. Cymbals, Gongs, Tam-Tams, Tuned Plates, Symphonic Triangles and Sound Sculptures. I did do hand-hammered and braised cowbells which sounded awesome and had elaborate motifs hammered into them but they just take so long. I'd have to charge more than a ride cymbal - so I gave up on those. MGR: You call some of your crafts "Sound Sculptures". Do you find that many drummers are currently cut off from (or unaware of) the world of possibilities metal percussive instruments offer? Matt Nolan: To a certain extent, yes. I hope that through my work I will broaden a few people's horizons - not just to things that I make, but to the possibilities that percussion has to offer in general. There is so much to explore. Historical instruments and new ones. Sound Sculptures in the cymbal and gong sense are really a Steve Hubback invention, inspired partly by his appreciation of the Baschet Brothers' work in glass, steel and aluminium. A very elaborate cymbal or gong could be called a Sound Sculpture. At the other end of the spectrum, you have large constructions with lots of different sounds you can play on them. The key thing to a Sound Sculpture is the visual art aspect. But they've got to sound good and be fun to play too. MGR: Are there any notable artists in particular in the drumming world playing Matt Nolan Cymbals? Anyone you admire who you would love to see take a shot at it? Matt Nolan: Well, there's a handful of guys who have big-brand endorsement deals but also have a piece or two of mine in their sonic arsenal. I don't like to squeal on them, though I think I'm up to 6 Grammy Award winners now. People I can probably name as the instruments they have are not strictly cymbals and thus don't clash would be Will Calhoun (Living Colour), Damon Reece (Massive Attack), Joe Travers (Billy Idol, Duran Duran, Zappa Plays Zappa), Billy Hulting (Percussionist with Zappa Plays Zappa), Emil Richards (nearly 2000 Hollywood soundtrack credits!) and a growing number of Orchestras including the BBC National Orchestra of Wales and the Boston Symphony. I have 3 endorsers myself. They are more percussionists than drummers really. William Winant - you may not have heard of him but he's played with Sonic Youth, Mr Bungle, John Zorn, the Kronos Quartet and lots more. Watching him play in Mr Bungle back in, I don't know, 1995 something like that, was quite inspirational. It's great that he now has some of my instruments. Lisa Pegher - solo orchestral percussionist. One to watch - maybe the next Evelyn Glennie. Ryan Edwards - a West African drumming expert (and he's had Malaria 3 times for his trouble) is working his magic for me in and around Berklee in Boston. MGR: How can someone buy Matt Nolan cymbals? Matt Nolan: You can buy them from my website - www.mattnolancustom.com - I typically have more in stock than appear on the shop page - so please email. I also undertake commissions. In the USA, on the web, there's usually some stock at www.mycymbal.com, www.rarevintagecymbals.com and www.brandontrading.com. As for bricks and mortar stores, there's usually some stock at Fenland Music in Ely, Cambridgeshire, England, La Baguetterie in Paris, France and Drumcenter in Cologne, Germany. Komaki Music in Toyko, Japan have some Symphonic Triangles of mine. In the USA there's Pro Drum in Hollywood, the Memphis Drum Shop, Maxwell's in NYC and Andy's Music in Chicago. Dave's Drums in Ottawa, Canada too. Or you could go to the London Drum Show, the Chicago Drum Show or PASIC. I have a booth at these and you can try out cymbals and buy them right there and then.